The Moto 360 has been unveiled previously, and is arguably the most anticipated Android Wear smartwatch, owing partly to its attractive round face. 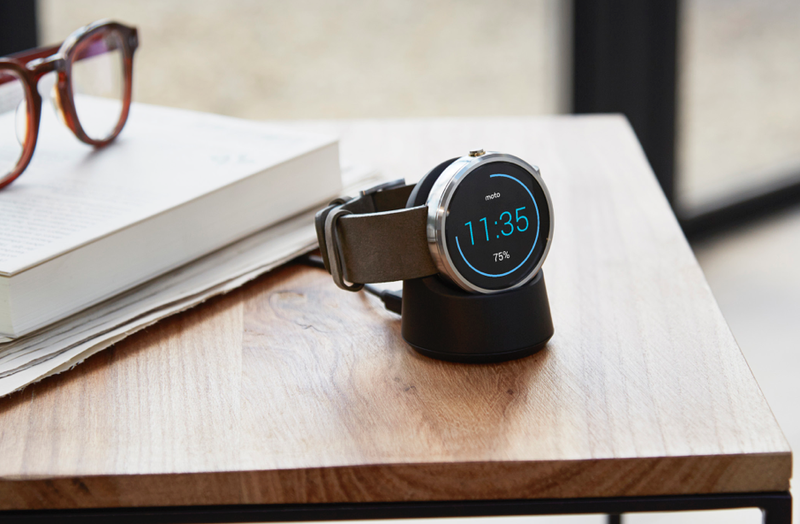 The wearable is finally landing, complete with heart rate monitor, in both black and gray metal finishes, with retail availability kicking off today at noon EST from Motorola.com, Best Buy and Google Play for $249.99. Two new metal band options will be available beginning “later this fall,” with the price rising to $299.99, and aftermarket metal band options will be on sale for $79.99 when that launches. At the same time, leather bands will also go on sale as official Motorola accessories for $29.99 apiece. We already knew a lot about the Moto 360, besides firm pricing and availability, but to recap the Android Wear watch has an edge-to-edge round display (with an occlusion at the bottom for radios and sensors) and is made from stainless steel. It includes a pedometer, and weighs 1.72 ounces, which is less than either the LG G Watch or the Samsung Gear Live. It also boasts wireless charging, another unique function (although we hear the iWatch is getting that, too). The premium materials and wireless charging, in addition to the design, are what Motorola is hoping will prompt buyers to spend an extra $20 – $50 above what the competition is charging. Like all Android Wear devices, it offers wake-on-wrist-flick, automatic voice response via the “Ok Google” trigger, and activity tracking. It’s compatible with any Android phone or tablet running Android 4.3 or higher, and it has IP67 dust and water resistance for splash and rain protection, and submersion of up to 1 meter for 30 minutes. It has a Gorilla Glass screen case, and Horween is producing the leather straps. Motorola is offering Motorola Connect to personalize the experience and differentiate its device software-wise form the rest of the Android Wear crop. This companion app for your smartphone lets you specify height, weight and age for more accurate activity tracking, allows for watch face customization (change colors and font choices), as well as provides limited location tracking for lost devices (it’ll show you your smartwatch’s last recorded location, rather than live updates, as it doesn’t have its own internal GPS). 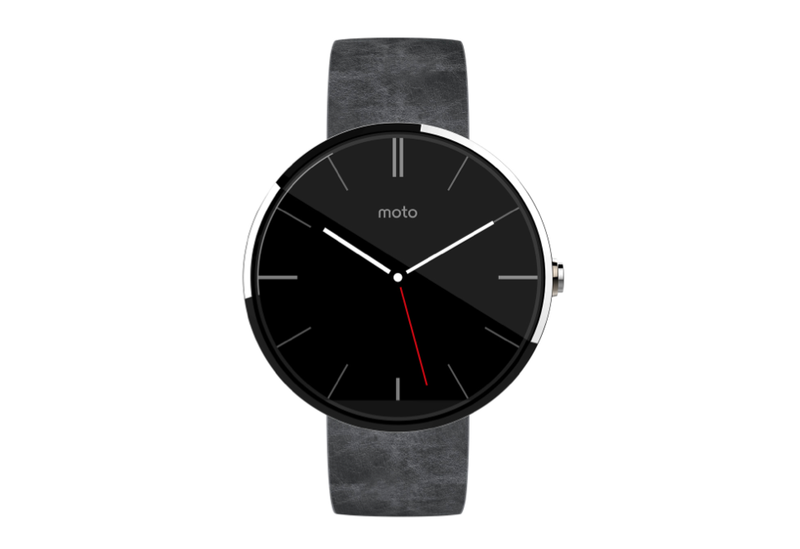 Tech specs for the Moto 360 include a 1.56-inch 320×290 display, good for 205ppi, and it has a 46mm diameter watchface. The 320mAh battery will get you about a day of mixed usage, and the TI OMAP 3 processor should give you all the oomph you need. 4GB of internal storage and 512MB of RAM is pretty standard, as is the vibration motor included for notifications. Personally, I’ve found that Android Wear doesn’t yet have what I need to make it a daily necessity, but perhaps Motorola’s careful attention to design will convince this traditional watch fan.